Sebastian Vettel took the lead on lap one of the Korean GP and never gave away again. Pole sitter Lewis Hamilton finished second after a race long defence against third placed man Mark Webber. 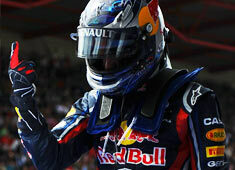 Red Bull has hereby also secured their second consecutive constructors' championship. Today marks the first ever decent start at Yeongham, this time around not behind the safety car like last year. As the lights went out, the front drivers kept their positions without problems, all having a nice getaway. The first straight though gets the pack together, as without DRS and a head wind there the leader is obviously at a disadvantage. At the end of that straight, Massa moved up to third place. The shorter straight after that showed even more spectacle, as Mark Webber managed to get back to the front after falling to to 6th. As Vettel took the lead ahead of turn 4, Webber moved up to 3rd place, behind Hamilton. Button meanwhile got shuffled around and ended up behind both Ferrari's, now in 6th place. As usual, on lap 3 DRS is activated on the cars, but by that time Vettel is 1.1s ahead of Hamilton. The difference is little, but just enough not to have DRS on Hamilton's McLaren. Meanwhile, since lap 1 light rain is falling in turn 4 and from time to time in turn 13 as well. By lap 9 Felipe Massa has closed the gap to Mark Webber and is challenging the Red Bull mostly in the quick first sector. Michael Schumacher meanwhile moved up to 9th after starting from 11th. The DRS zone here is quite short, only the last half of the long straight. It is a problem for people trying to pass with DRS virtually useless to get along someone. By lap 11, surprisingly no one has pitted yet, where the expectation was that the super soft would only last for the first ten laps. The track temperature though has dropped due to the drizzle. It is now 24°C instead of the expect 34°C. On lap 12 Massa has dropped back from Webber again, and is now backing up his own teammate Alonso who on his behalf gets attacked by Button. Nico Rosberg meanwhile is also quickly closing in on them. On lap 13 Di Resta is the first to stop, and one lap later Button and Rosberg stop simultaneously. Rosberg's pitstop though is quicker, bring the German out ahead of Button, ruining Button's plan to get the undercut on the Ferraris that were ahead of him. Rosberg though went a bit wide on the exit of the pitlane, allowing Button past, only to get him back with a huge slipstream advantage into turn 3. Another lap later though, Button used DRS the other way around and passes Rosberg. Massa then pitted on lap 14, Alonso on lap 15, Hamilton on lap 15 as well while Vettel pits on lap 16. Interestingly, Webber took on the prime tyres while Vettel chose to copy McLaren and take on a set of options. On lap 17 the safety car is deployed after an accident between Petrov and Schumacher. The Russian bumped into Schumacher's rear end violently, breaking Schumacher's rear wing, while his own front wing was entirely gone. Petrov's race ends in the pitlane, while Schumacher stops alongside the track. Alonso was lucky to have avoided the incident though, missing Petrov's uncontrollable car by a few centimeters. So, behind the safety car and after most first stops, Vettel is still first, ahead of Hamilton, then Webber, Button, Rosberg, Massa and Alonso. At the end of lap 20 the safety car leaves the track, but just like with the start nobody managed to gain a place in turn 1. The battle is on through turn 3 and 4, but again no position changes at the front yet. Kobayashi is involved in a minor contact with Senna on lap 22, breaking off part of his left front wing endplate, which clearly is producing a lot less downforce due to that incident. On lap 25 and after getting passed by Senna again, Kobayashi enters the pitlane to take on a new front wing. On lap 27 Rosberg out-brakes himself and as a result gets passed by both Massa and Alonso. In positions one to three, cars are packing up together, as Vettel is now slower than both his followers. On lap 28 Hamilton is 1.1s down on Vettel while Webber is 0.9s behind Hamilton. The second Red Bull here appears to have a better car on hands, as even though on primes he has no trouble at all following the men ahead, and surely his tyres will last longer. 4 laps and one fastest lap by Vettel later, Vettel opened the gap to 4 seconds. Hamilton and Webber pitted simultaneously on lap 34, rejoined the track in the same order. As of turn 4 though it became interesting with Webber and Hamilton virtually side by side all through turn 5 up to turn 13. Massa meanwhile took on the primes on lap 34, whereas Alonso is trying to go long on his options. On lap 35 the Spaniard puts in a new fastest lap of the race and is running in first place as all others that were ahead of him have pitted. Massa meanwhile is stuck in 9th position behind Buemi. Alonso must have had enough of trailing his teammate since the very start of the race. At the end of lap 37 Alonso takes on the prime tyres and rejoins the track a second or two ahead of his teammate. Alonso has hereby also proven that the options are far more durable around here than what teams expected. Lap 40, 41 and 42 marks a series of more fastest laps by Alonso, who is now in clear air and closing in on Button by approximately 6 tenths a lap. The difference 12 laps from the end is just 4.2 seconds. Webber meanwhile is still stuck behind Hamilton. He is very close but the short DRS zone is costing him dearly. Mark is always right on the tail of Hamilton through turn 1 after being mightily quick through S2 and S3, even though being in dirty air. Lewis though gets much better traction out of each slow corner, generating enough of an advantage to keep Webber far enough behind him at the end of the straights. On lap 49 Webber even got past Hamilton, but the latter than re-passed the Red Bull thanks to DRS. On lap 51, Vettels leads by 11.8 seconds over Hamilton. Webber is a close third, a second ahead of Button. Fernando Alonso is 5th, having closed the gap to Button down to a second. No position changes at the front meant Vettel wins the race, ahead of Hamilton and Mark Webber. Jaime Alguersuari though passed Rosberg for 7th in the last lap, out-dragging the Mercedes car which struggled to find traction on badly worn tyres. After the finish line, both Alonso and Rosberg stopped along the track, having run out of fuel after requiring maximum power of their engines in the closing laps.